My name consists of just a first name and no surname. Will there be a problem regarding my name in the country I visit with a tourist or employment visa? Are there countries in the world where this might be a problem? Single names are quite common in eg. southern India, Indonesia and Mongolia, and thus embassy staff are reasonably used to dealing with them; a single-named Indonesian friend of mine had more problems dealing with smaller bureaucracies like (in the US) library cards, university IDs, etc. She usually ended up duplicating her name or creating a fake initial: "H Henny", "Henny Henny", etc. The following is US specific, but I think this is followed the world over. If you ever got to apply for a US visa and in case you don't have a first name or a last name, the US consulate will consider your entire name as your last name and mention FNU (First Name unavailable) in the first name field. It should not cause any problem as it seems to be a pretty common occurrence in South Indian names. 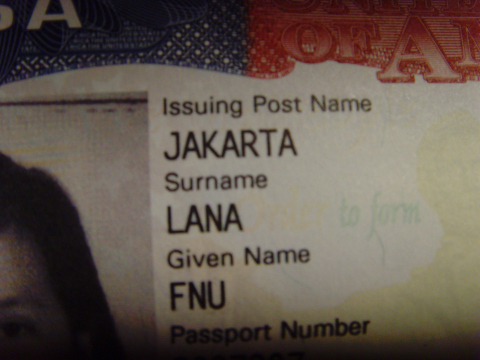 I had a related problem in Germany - I carry an Indonesian passport, which in the past did not distinguish between first and last names (precisely because many Indonesians do not have both). Not the answer you're looking for? Browse other questions tagged visas paperwork regulations countries or ask your own question. I have a single name written as my surname in passport, while my given name is blank, will the German Embassy accept this? Are there Schengen countries through which it's easier to get a visa than others?